Peak Season - Weekly Only! Check Schedule to right for rates! Off Season Right after Labor Day to June 1st. Living Room with new flooring! All 3 Cottages have a Lakeside Decks and a Ground Level Patio Area! All have plenty of Outdoor Furniture - picnic table - Firepits - Charcoal Grills! Lakeside view of cottage #1 with deck and patio area! Kitchen with plenty of storage space! Gas Stove- Microwave - Ref. -Fully equipped Kitchen! 2018 2 SOFA'S , 1 a full size sofa bed- chairs are gone. Lake Front View - docking for your boat! Plenty of outdoor Furniture - 2 Picnic Tables - firepit! This cottage is also located on the west shore line of West Gun Lake! 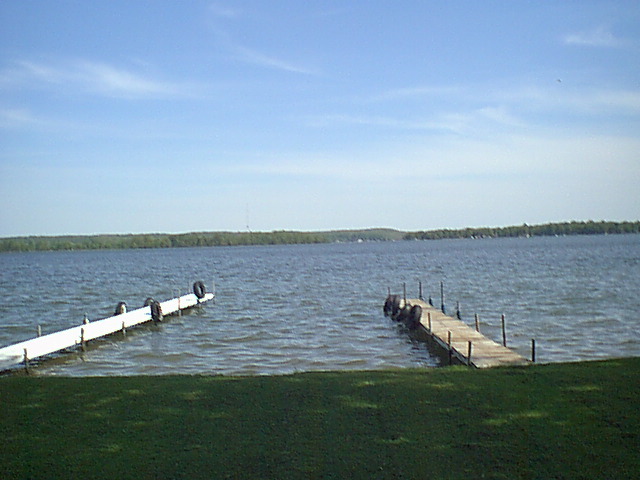 When sitting on the deck, you are looking across the lake at State Park Peninsula! Recently refurbished 2 bedroom – 1 bath lakefront cottage! About 800 sq. 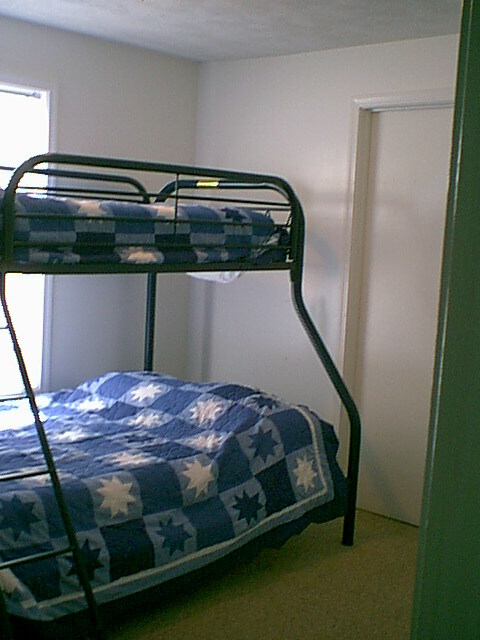 ft.- Sleeps 6-7 comfortably - max.# of 0ccupancy no more than 7 including children & infants! Fully furnished: gas stove, ref.,microwave, toaster, coffee pot, blender, pots, pans, dishes, charcoal grill, picnic table, fire pit, washer & dryer. All linens provided – you may want to bring beach towels! 1 bedroom with Queen size bed – 1 bedroom bunk with full size bed on bottom & twin on top – full size futon sofa in living room. 39”TV with DVD & VCR -WiFi Internet- 23" Flat Screen TV in bedroom with Queen Size Bed! Window & Portable A/C units- basic cable! Dock for your boat- also several area marinas do rent fishing & pontoon boats! check schedule at right for each week's rate! Security deposit of $200.00 is required to reserve your week – deposit refunded only with 60 days notice of cancellation. Rent due -in full- 60 days prior to your arrival. NON–REFUNDABLE unless able to re-rent your week(s). Security deposit refunded within 10 days of your departure with cottage being left in good condition! Text or Email for reservations today! Off Season Rental 6 Month Lease Required - $800/month + Gas & Electric-Bacis Cable Internet @ your expense! Kitchen - Plenty of Storage Space! Gas Stove - Microwavee - Ref. Full Bath - Tub with Shower! Bedroom with Queen Size Bed! Carpet has bene removed from Both bedroom as of spring 2018 2nd Bedroom with twin on top and full size bed on bottom! Interested in this Cottage or want more information. Visit our Contact Page.